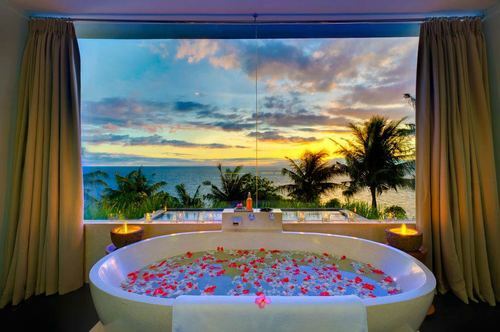 I don`t know where this tub with a view is located, but it looks like Hawaii. How happy would I be to be dipping my toe into this bathtub right now? Super insanely happy, that's how happy I'd be! 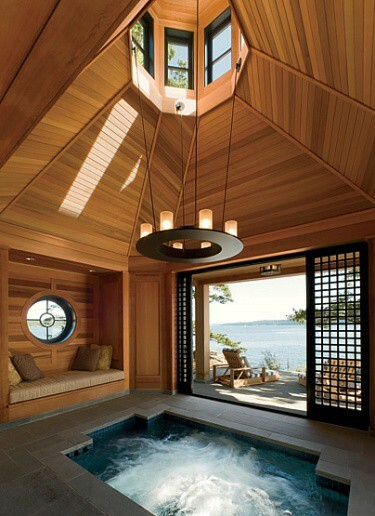 I wouldn't last long in the tub though, I'd want to run outside and explore that view. image: unknown. Does anyone know how to find the source of a photo you saved on your ipad? I've been searching for an answer but haven't had any luck. I guess I will have to swing by the apple store one of these days. Ack! Don`t you just love the colour of these walls? 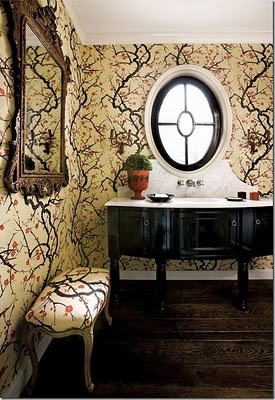 This bathroom just makes me happy. There are so many great details. 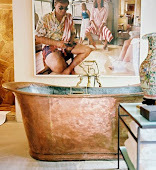 From the subtle art deco vibe of the marble fireplace, to the gorgeous floral floor tile pattern, which brings my eyes up to those fantastic detailed legs on the vintage tub, and that super fun retro poster that just sets the tone of the room. 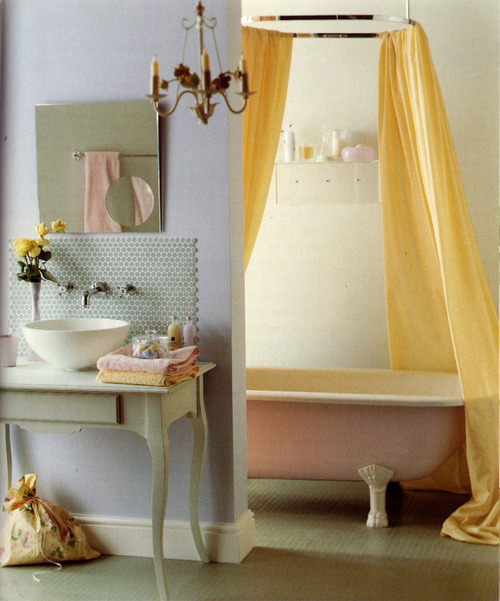 The colour palette in this bathroom is so refreshing and vibrant. Love, love, love it. 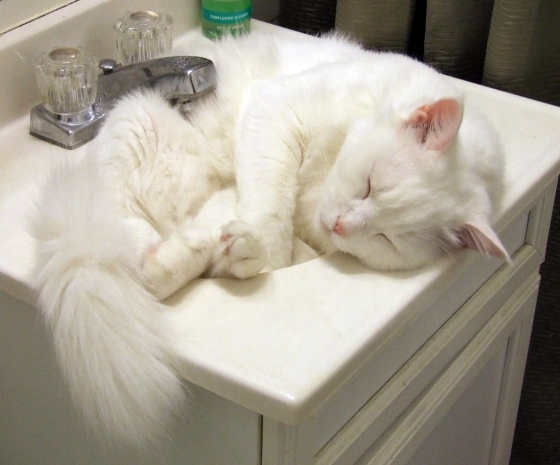 Ok, technically my husband didn't stay in the bathroom however, he is capable of sleeping pretty much anywhere (yes, I am jealous of this trait) so it wouldn`t have been a problem for him. Last week he had business meetings in Toronto and decided to stay at The Ritz. 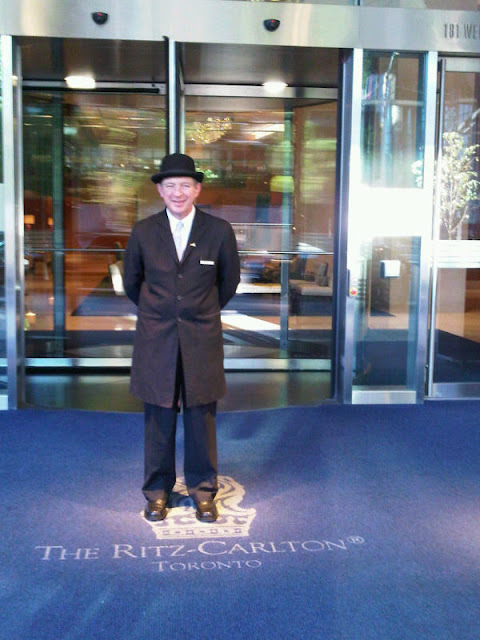 I always get excited about staying at fancy hotels, so I couldn`t wait to hear all about it. 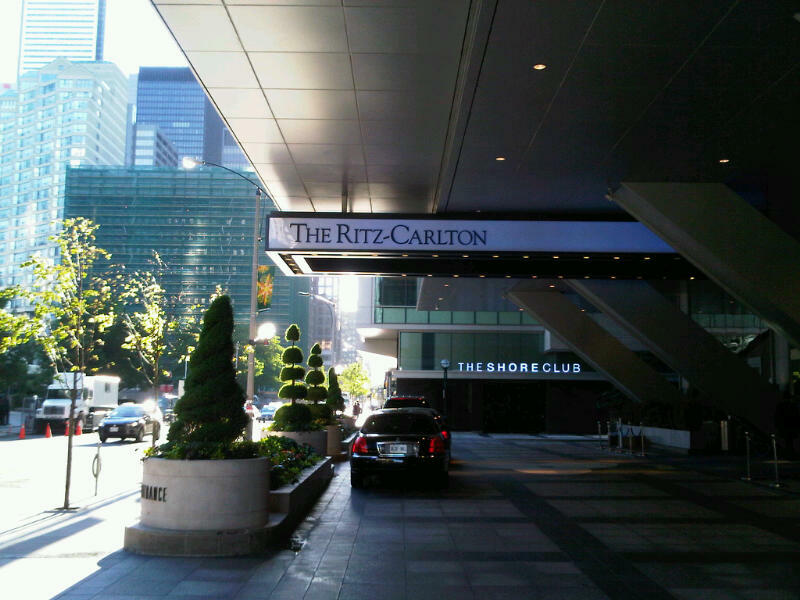 I had to know if the Toronto Ritz left chocolate mints on your pillows. Well the big sweetie that he is took photos of his bathroom. He will hate it that I called him a sweetie, but he is just too sweet for taking these photos so there is no denying it. Considering the jam packed week he had it was incredibly nice of him. And what was even nicer was the fact that after he emailed me the photos I asked him to take a few more and he did. While other travellers are down at the bar unwinding, my guy is standing on top of the tub to get a better angle shot. Now if that isn`t love, I don`t know what is! 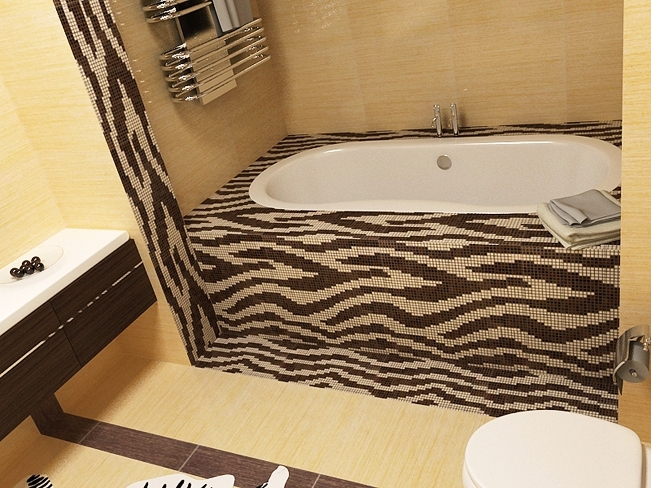 Maybe you are wondering why I want to feature hotel bathrooms on Todaloos. 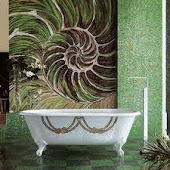 And why not a little dreaming...maybe one day someone working at an uber fabulous hotel will read my blog, let out a shriek and demand that I come check out their gorgeous bathrooms asap! 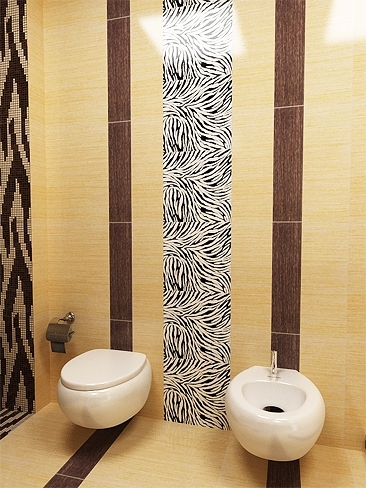 5 years from now you won`t be banging your head against the wall for choosing out dated tiles! 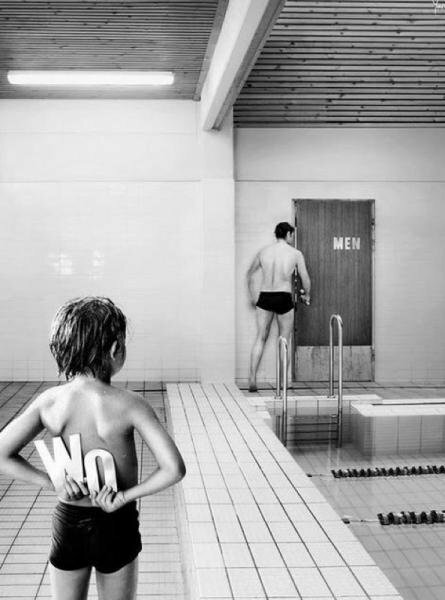 And who doesn`t want that?! Click the ``click to see more`` if you would like Lee to let you inside. 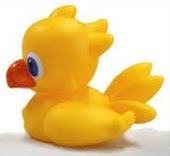 One of Sophia Loren`s beauty secrets is to take the occasional bath in virgin olive oil. ``"A lot of rest. Good thoughts. Exercise," says the star. She rises most days at 5 a.m. and usually goes to bed by 8 p.m. In between, her daily beauty rituals are decidedly low-maintenance. She washes her hair with baby shampoo and colors it herself when necessary. She does her own manicures and her own makeup, using products blended to her skin tones by a movie-makeup-artist friend from Italy. Her only indulgences, she says, are the potions—such as an eye cream containing vitamin A and a rosewater face lotion. These are specially formulated for her caramel-smooth skin at a lab she won't name tucked away somewhere in France. getting up at 5am and to bed by 8pm part! If you want to read the rest of the article click here. I`ve said it before, but I`ll say it again, I think one of the most overlooked design elements in the bathroom are windows. 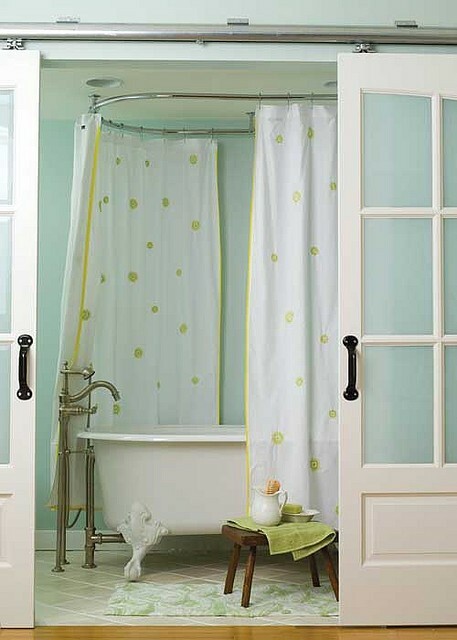 Why work around the window when renovating a bathroom? If you are going to spend all that money to renovate, why not really up the wow factor? 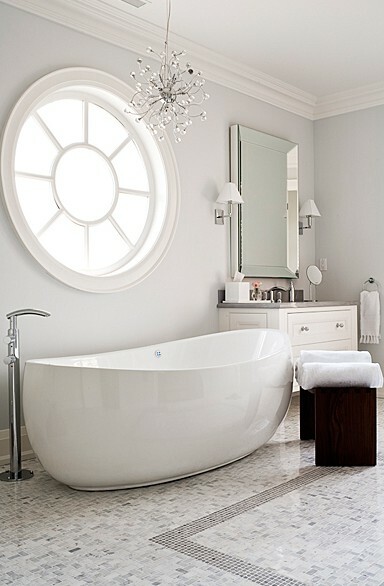 Using a different shaped window in a bathroom can really add a unique and unexpected design element. Of course you have to consider how the change in window shape will affect the outside look of your house, don't want to mess that up! However, if your washroom window is on the side of your house or facing the backyard I think you have more flexibility to changing the shape and size of your bathroom window without becoming the wacky house on the street. 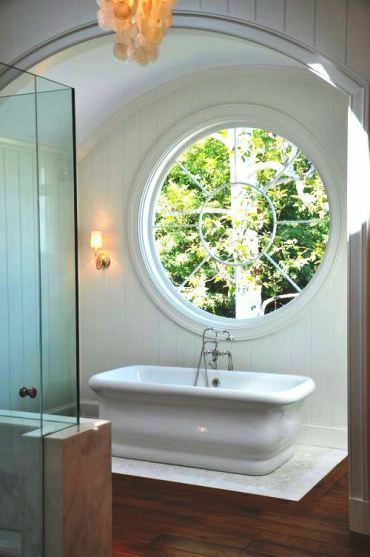 Today I though I would pull together some photos where round and oval windows were used to add drama to the bathroom. 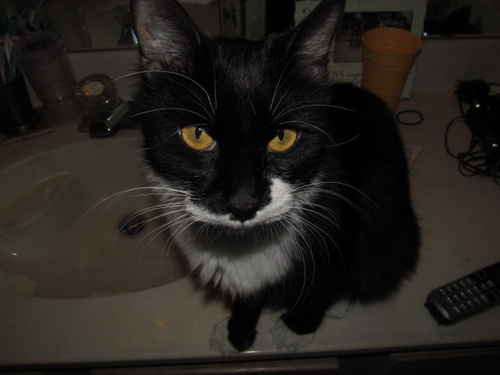 Now here`s a smarty cat who could teach the toilet drinking dogs a thing or two. the bathroom? Next time knock first." 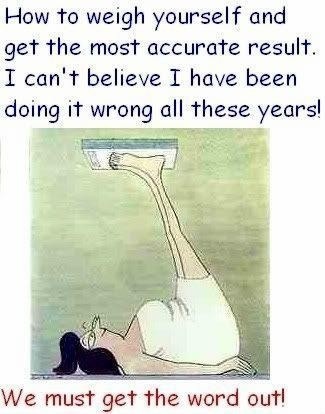 weight? 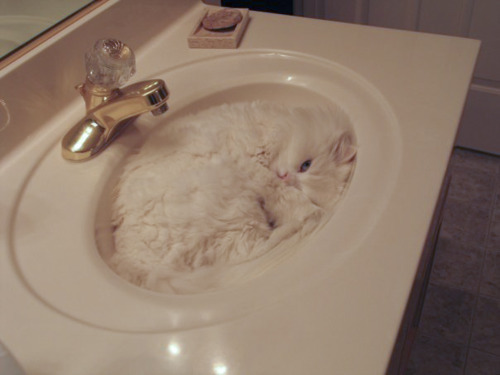 'Cause I can't fit in here like I used too". Aloha! Could life get any better then this? My favourite detail in this bathroom are the beautiful shampoo and soap nooks. I love the idea of framing them like picture frames. 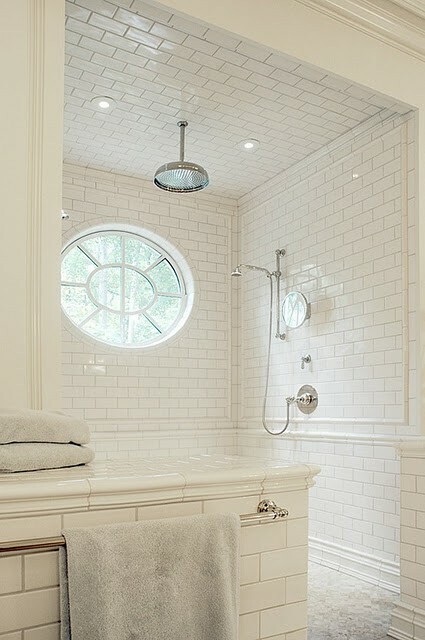 Having two shower nooks mirrors the look of the double windows which adds symmetry to the room. A nice touch to keep in mind. 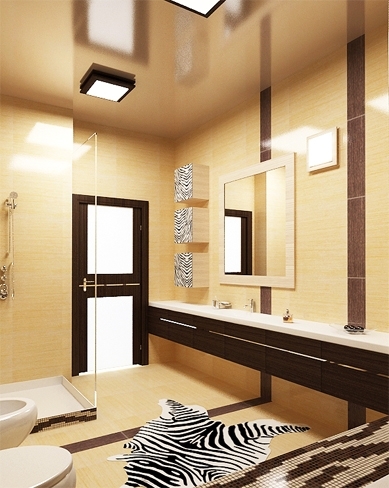 The colour combo in this bathroom is fantastic. 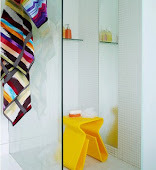 The mustardy yellow colour of the shower tiles paired with the mossy greens of the towels and chair fabric is stunning. 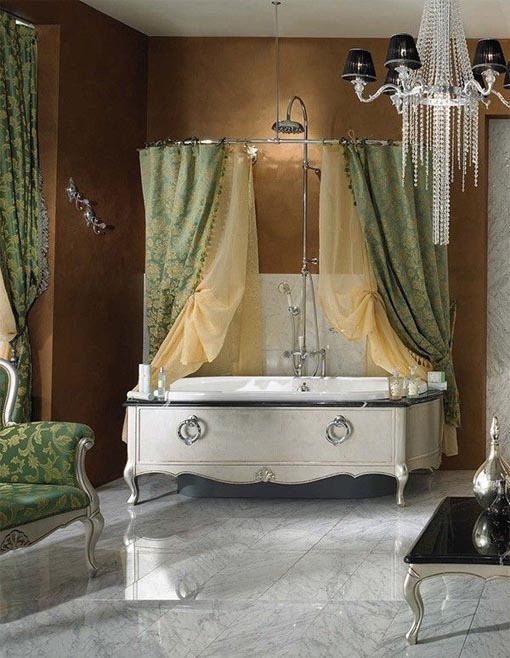 I think this is a great colour combo for someone who likes the idea of a classic beige bathroom but wants to do something a little different but just as versatile. 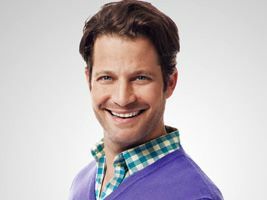 Whenever I saw Nate Berkus on the Oprah Winfrey show he always seemed like such a nice, sweet guy. I still remember the day Nate sat with Oprah, unshaven, looking broken, talking about how he had lost his partner, Fernando in the Tsunami. I sat there crying for him, you could feel his pain thru the tv. A friend of mine had also been in Sri Lanka and was very lucky to have survived. Watching Nate that day, I just hoped he would be happy again and be able to look at that amazing tree photograph Fernando took and smile. So it is nice to see that he is happy again. 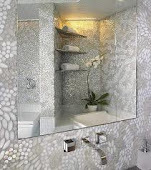 Now let`s take a look at how Nate worked his design chops to renovate the bathroom in his Chicago condominium. Nate`s master bathroom was originally 100 square feet (wish I had before photos to show you). It only had enough room for a small sink, shower and toilet, no tub. In renovating his bathroom, Nate was able to triple its size by stealing space from his adjacent dressing room. Don`t cry for Nate though, the dressing room is still pretty spectacular - there`s a photo of it at the end of this post. 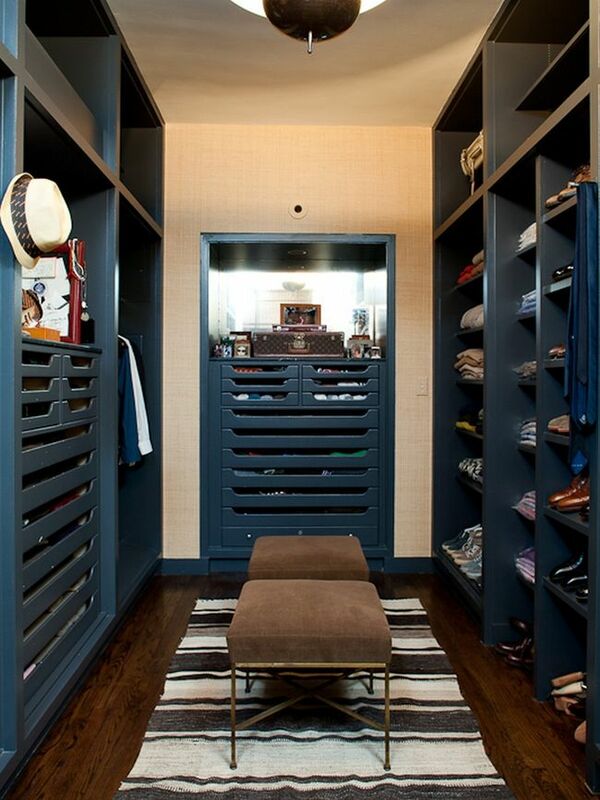 I would trade my closet for his revised dressing room in a split second. Especially if the trade included him organizing my stuff! In a tour of his apartment on Oprah's show he mentioned how super organized he is. 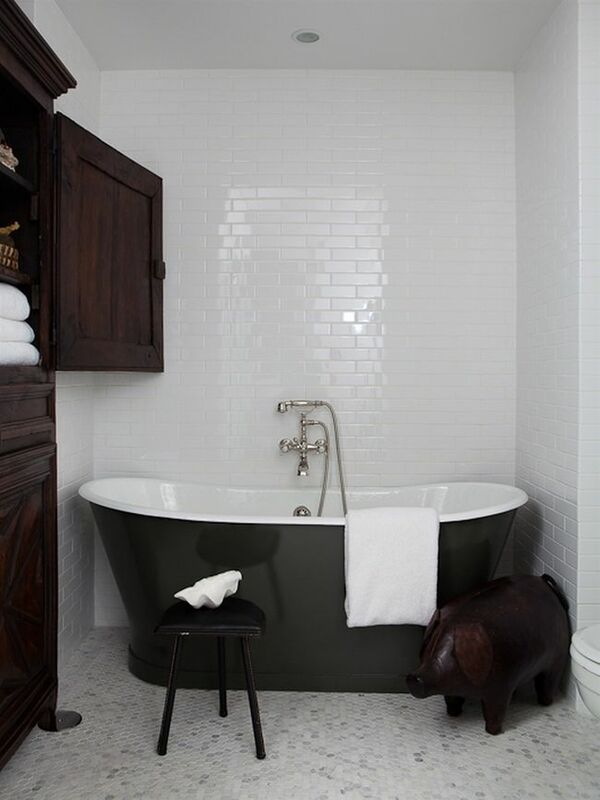 If I were to describe Nate`s bathroom I`d say it was Masculine, Chic, Elegant, Timeless with a splash of fun all rolled up into one great master bath. Nate was going for an Industrial look in his master bathroom. 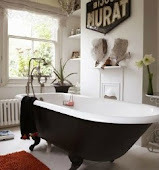 Here`s an almost identical shot of the tub area without monsieur piggy. I decided to include it because I thought we could see the colour of the tub better. Looking at the above photo I originally thought the exterior of his tub was black, then when I saw the next photo I was going to write that the colour of his tub was actually silver. Oh how wrong I would have been. Luckily I nosied around a bit more and discover that Nate actually had the exterior painted his favorite colour, Army green (if you want to know the exact shade, it is listed in the resource section at the bottom of this post). 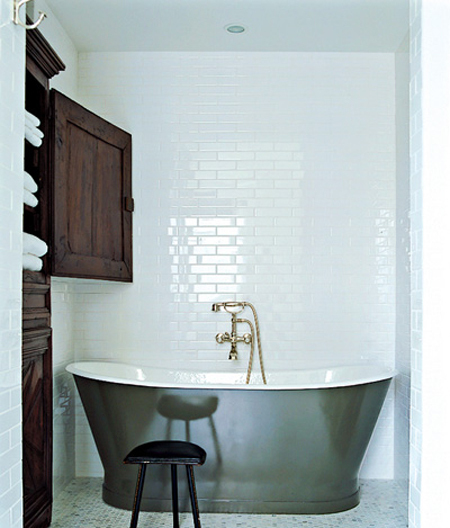 The freestanding cast-iron tub was imported from England. I am impressed that Nate had the tub repainted. 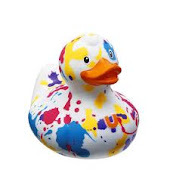 I don`t think that is something most people would even think of doing, and especially to paint it such a unique colour. To accomplish the Industrial look, Nate paired classic elements with a lot of metal detail.Nate used classic hexagonal marble tile on the floor and white subway tiles on the walls. Per Nate, when designing a bathroom he likes to use timeless materials such as these because he feels "they last forever and you never get sick of them." So true. Planning ahead Nate had a nook built into the bathroom so he could add an antique armoire. 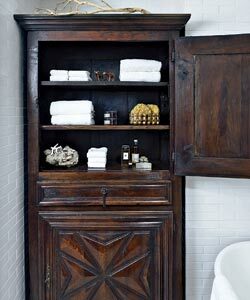 The warmth of the rich, old wood of the armoire helps to offset the coldness of all the metal, giving the bathroom a warm inviting feel. I absolutely love these shots of his vanity area. It`s not very easy to see but, inside the antique brass mirror frames are screws that reminded Nate of a Cartier watchband. 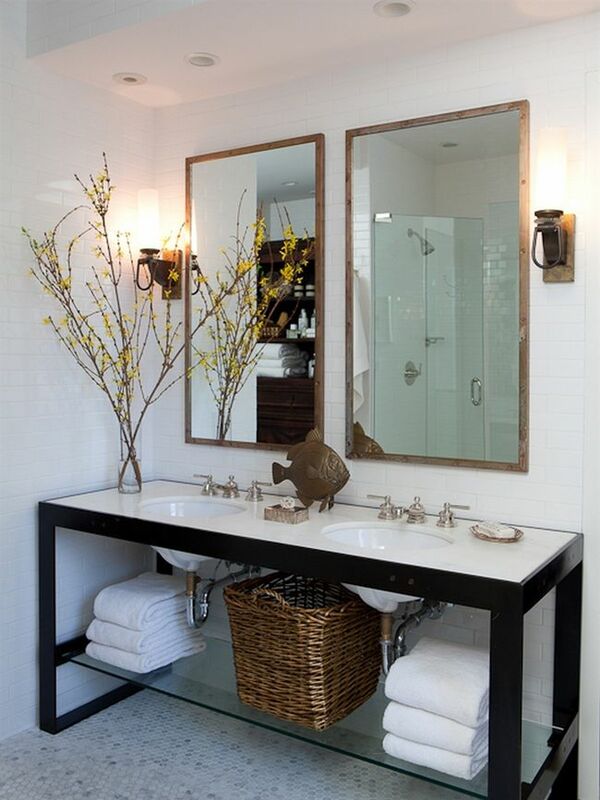 Nate and his assistant, Sasha Adler, designed the metal vanity to compliment this detail in the mirrors. If you look closely at the front edge of the vanity & a little to the right of the undermount sink you can see two brass coloured circles. Nate`s vanity is simply stunning. The white marble countertop and oval sinks are gorgeous and contrasts beautifully against the metal frame. 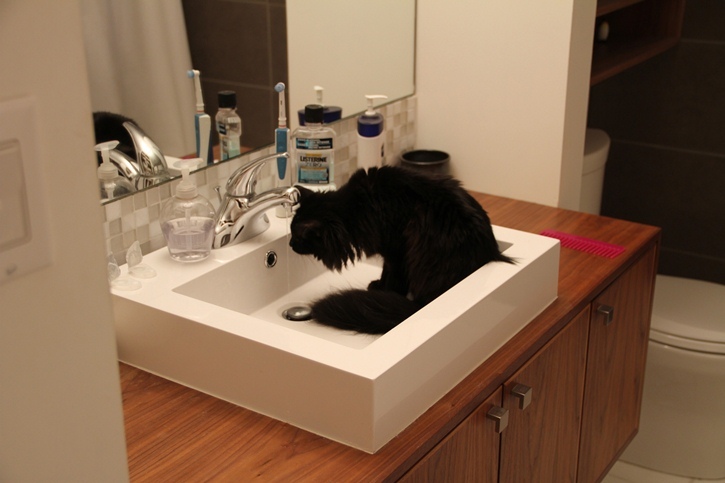 I like that he went with undermount oval sinks instead of rectangular ones. 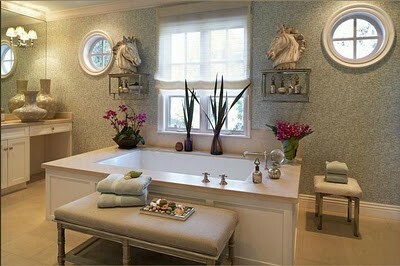 The oval sinks add a nice touch of softness. And the exposed plumbing plays up the industrial look. 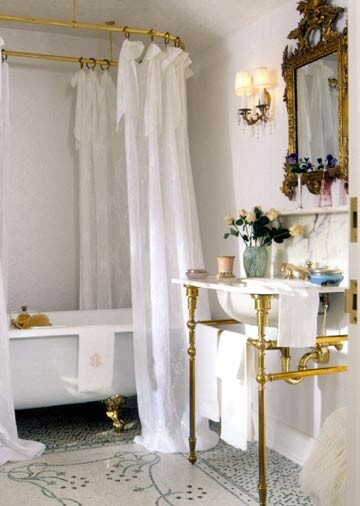 Another great detail are the brass wall sconces. 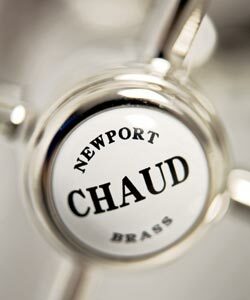 When Nate bought them they were gold-leafed, he stripped them down to the natural metal. This is definitely a tip to remember. Don`t let the colour or texture stop you from buying something that has a fantastic shape. 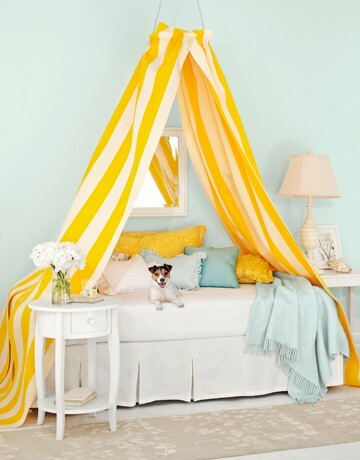 You can always repaint, strip or refurbish it to get the look you are going for. Wondering where he got monsieur piggy? Ok, I don`t know what Nate calls him or even if he has given monsieur piggy a name, but there is a cute story behind the leather pig. Nate had seen him (here I go giving the pig a name AND a gender!) 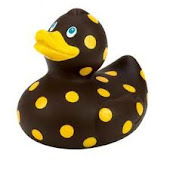 at the Liberty store in London (hmmm, I guess monsieur piggy would have a British accent), spoke to Brian Atwood (his boyfriend at the time) about him and a few weeks later Brian had the cutie shipped to Nate`s Chicago condo as a surprise. 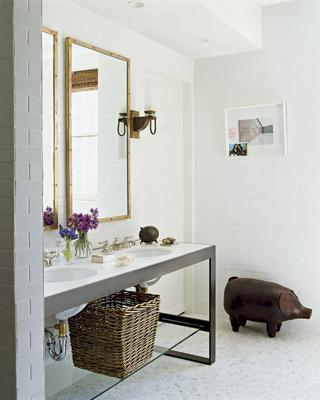 The minnie me piggie on the vanity is a 1950s Italian ceramic piglet. So miss nosey that I am, I wondered what the story is with Nate and pigs. Now this is just a guess on my part, but I looked up Nate`s year of birth (1971) so under the Chinese horoscope he falls under the sign of the Pig! Perhaps that is why he has these 2 little piggies. But you want to know what`s really interesting about Nate being a pig under the Chinese horoscope? It`s that one of the professions recommended for people who fall under this sign is to be an interior decorator! Cool no?! I think the CIA will be knocking at my door any minute now offering me a job as a spy. Here`s Nate`s dressing room. I think it is still pretty fantastic. 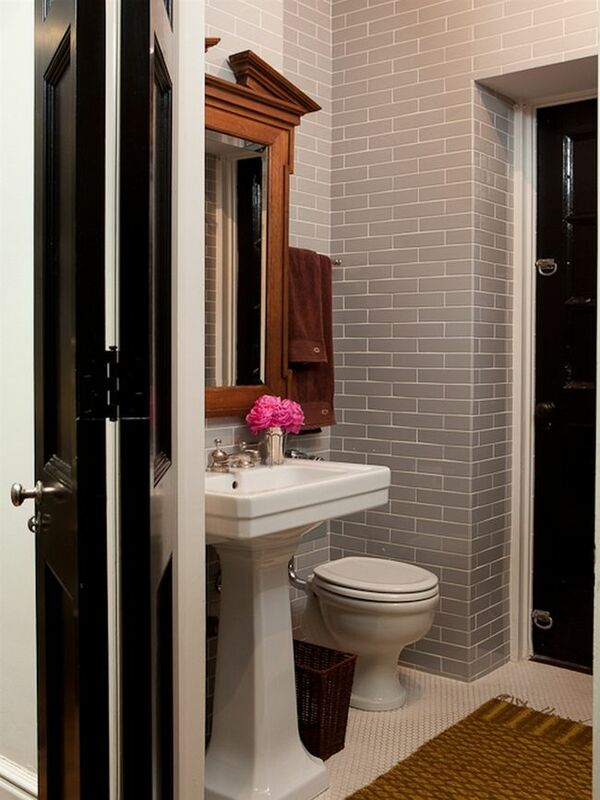 Originally it was white, but Nate repainted the millwork to coordinate with the industrial feel of his master bathroom. 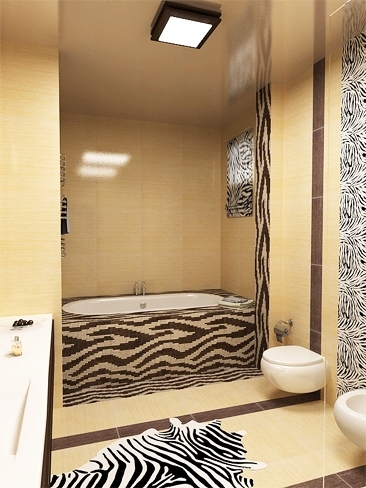 And here`s a shot of his other bathroom. 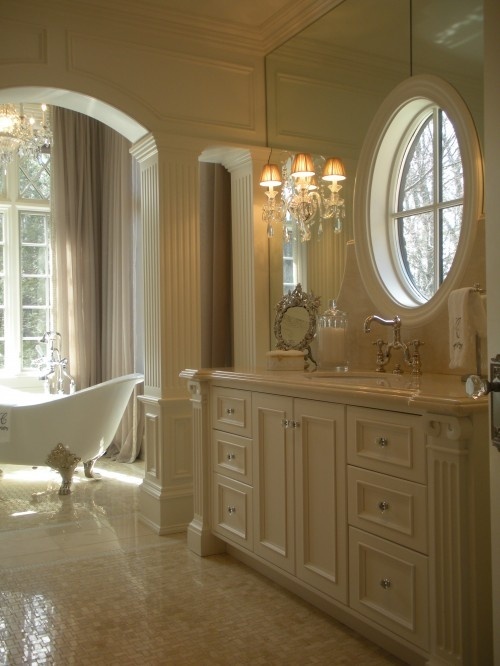 This bathroom has a similar style to his master bath. However, the stately mirror and what looks to be light grey subway tiled walls (after guessing wrongly on his tub colour, I could be wrong with the colour of these tiles too! ), makes me think more of Washington DC then Industrial. 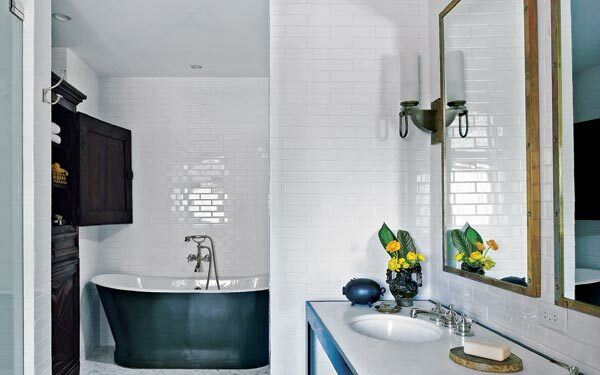 I think Nate`s bathrooms are great inspiration for anyone who wants to create a masculine and timeless bathroom. If you want to see the rest of Nate`s Chicago condo, you can check out the pictures here. It is up for sale, so if you really love it now`s your chance to own it! 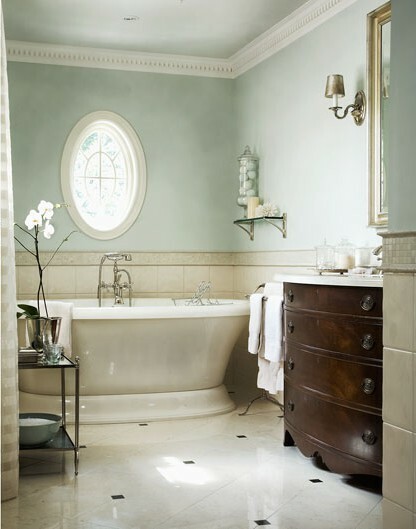 Balmoral dual cast-iron skirted tub, shop4classics.com exterior painted in Benjamin Moore's Tuscany Green, #2140-20. Paint color on millwork, Benjamin Moore`s Cheating Heart, #1617. 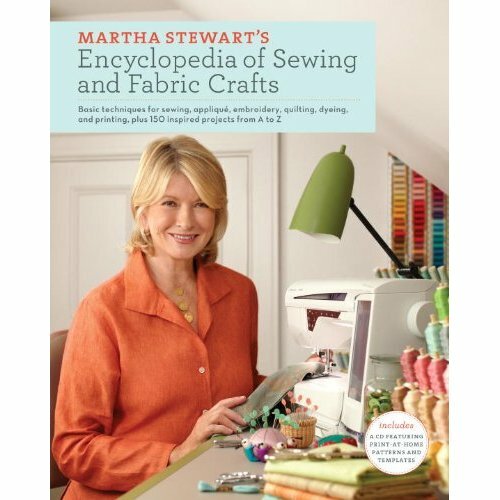 All the great resource info was found here: Chicago home mag. Unfortunately, I don`t have resource info for the second bathroom. I have to say this is one wild washroom! How about you? What would you do? And did you notice their silver toilet paper?! If you had to pick, which of these jacuzzi tubs would you want to relax in this weekend? few friends to kick back in after spending a day on the lake? The peaceful tranquillity of this stand alone jacuzzi overlooking lush greenery where you could lay back and recharge from your week and maybe read a good book? 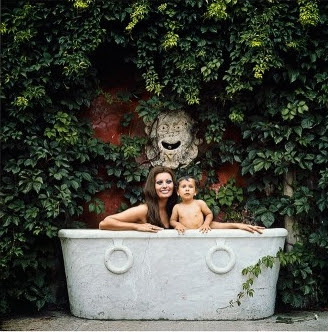 vintage tub with that big smile on his face. 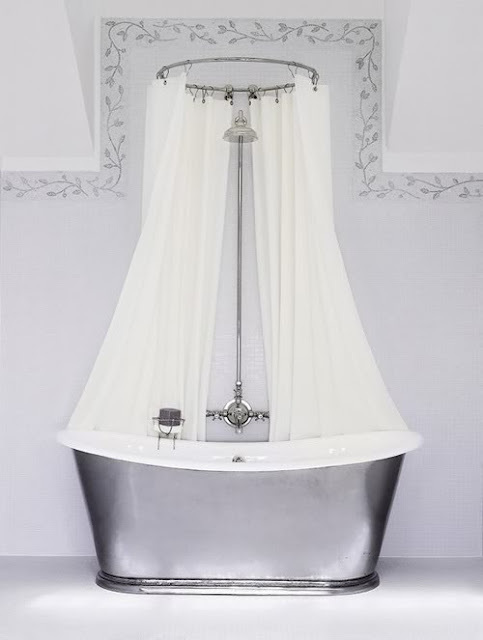 circular shower curtain rod to a bathtub gives a tub such a classic look. These next two are so pretty feminine. 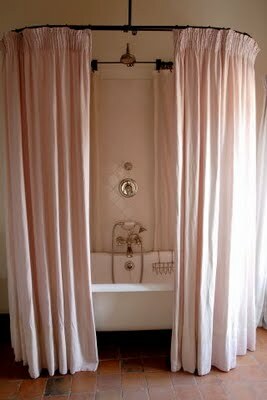 I love the pleat work at the top of these ballerina pink shower curtains. oh what a beautiful floor! 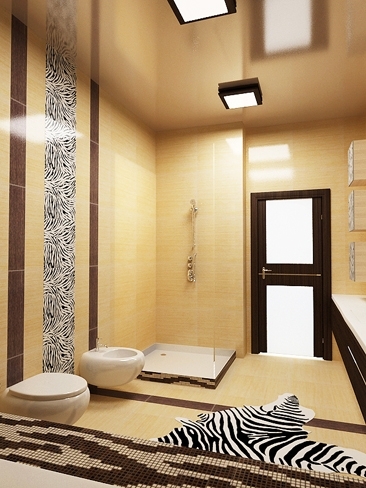 Or how about a rectangular shower rod for a change? 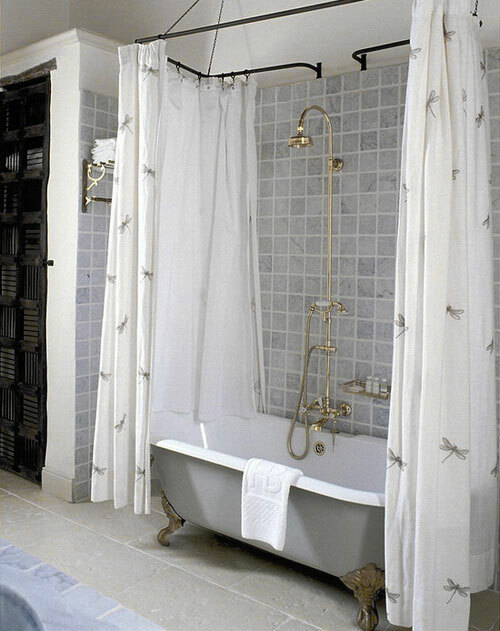 I like their dragonfly shower curtains. 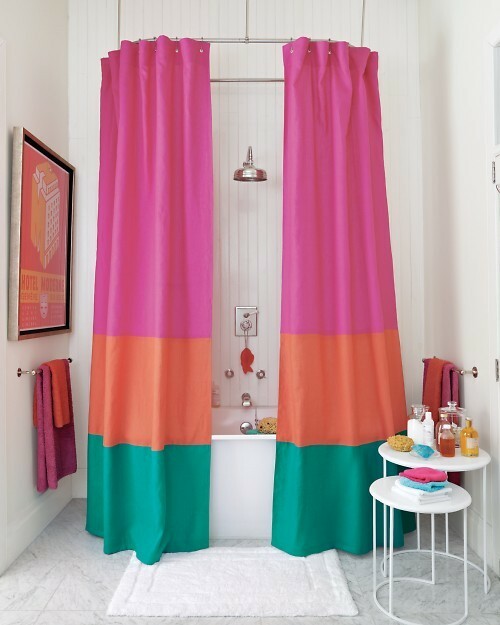 And I couldn`t do a post on double shower curtains without including this super popular hot pink striped shower curtain set from Martha Stewart.